Who wants to trim the tree? This is a very different kind of garland for a very dark holiday - butcher convention when you hang this awesome Butcher's Meat Hook garland with three bloody meat hooks - sure beats tinsel! 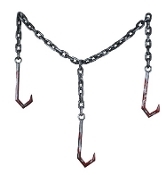 Includes 3 large bloody meat hooks connected to aged plastic chain. Nearly 8-Ft Long! Perfect horror weapon display for Meat Market, Chop Shop, Morgue, Mad Scientist Laboratory, or serial killer costume accessory.